GOATS! Goatsgoatsgoatsgoats…this is what my friend Dan and I used to yell at each other in his mom’s car when we saw the goats the city of Oakland would place on the side of the road in our neighborhood to eat all the extra grass and prevent wildfires. That was my only interaction with goats prior to my experience on the goat farm! If you have even one pet you are aware that they require a lot of maintenance. So consider 200+ goats and you can imagine farm life. This is why they take so few vacations! 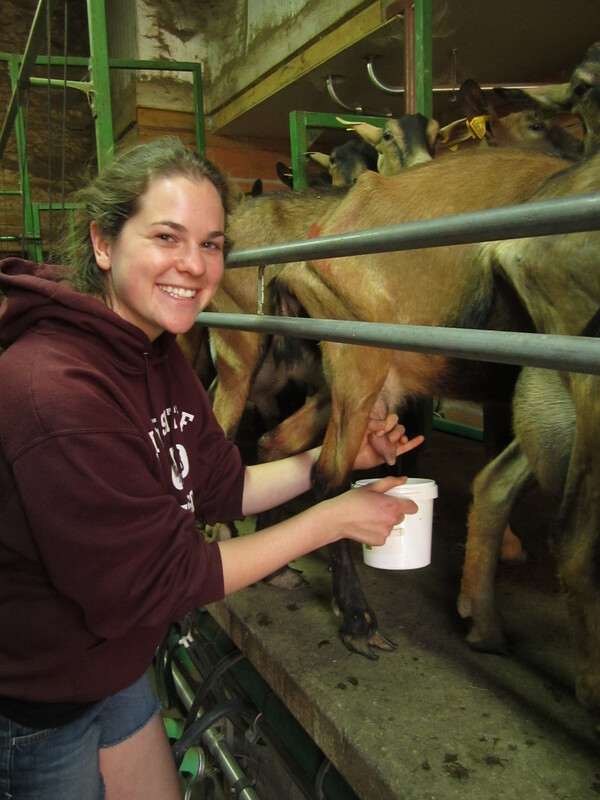 Besides all the cleaning and feeding, milking the goats is the most time-consuming aspect of goat farming. 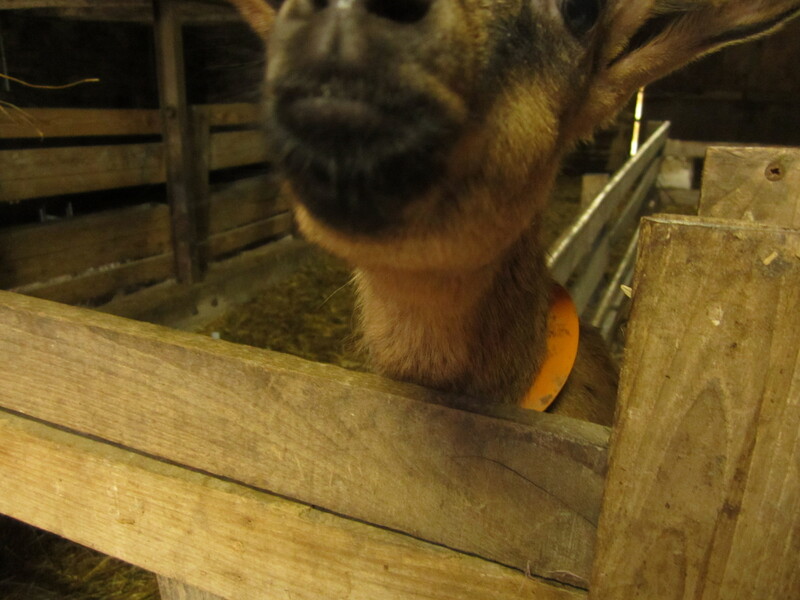 On the very first day I assisted with la traite (the milking), mere minutes after Maëva told me a story about her sister getting pooped on by a goat during the milking process. Yikes! Luckily I avoided being pooped on the whole time! 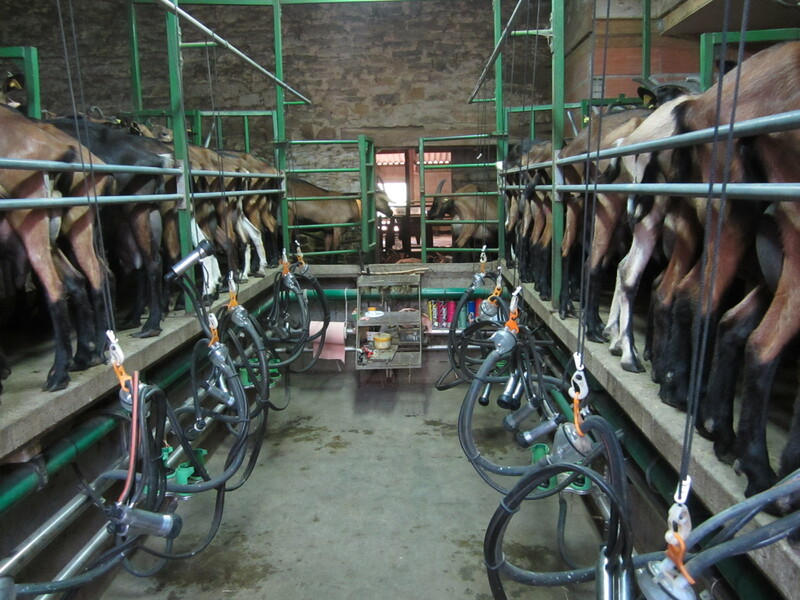 This process needs to happen twice daily with the same amount of hours in between each milking. On this farm, it was 6am/6pm. 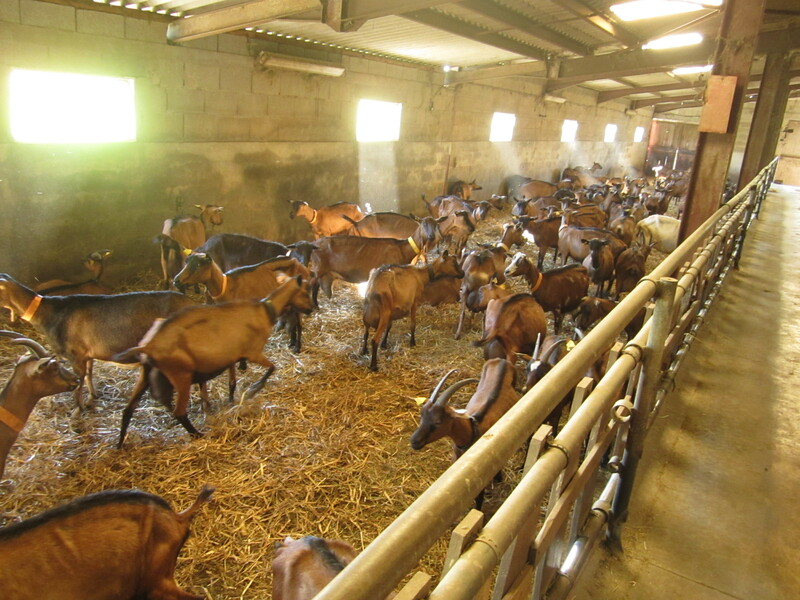 First, the goats are fed before rounding them up to bring into la salle de traite (the milking room). A wheelbarrow is used to distribute a sort of kibble-like food mixed with powdered minerals and vitamins. There is a hole in the wheelbarrow so when you walk quickly down the row, the food pours out in a line. 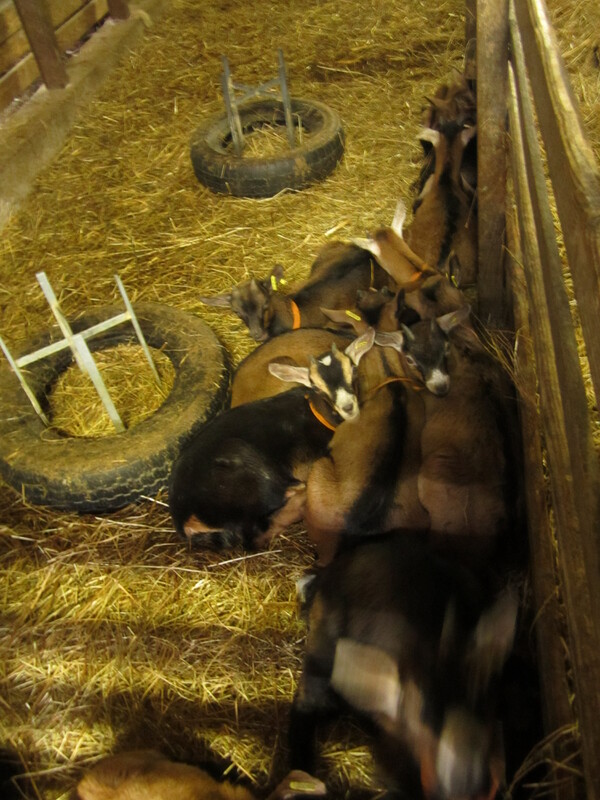 My job was to follow the wheelbarrow with a broom and sweep the stray food back towards the goats’ eager tongues. They eat so voraciously that food gets propelled far out of reach of their mouths. The first time I witnessed this process, I was amazed by what I saw and heard. As soon as the goats would hear the food being poured into the wheelbarrow, the sound of a stampede would fill my ears as they ran to line up at the gate and wait expectantly. The second the food was distributed, a frenzy of floor-licking would begin. It seemed as though they hadn’t eaten for days. Burps and gulps echoed off the dusty walls. I kept thinking, “they eat like such savage animals” and then I would remember, DUH they ARE animals! 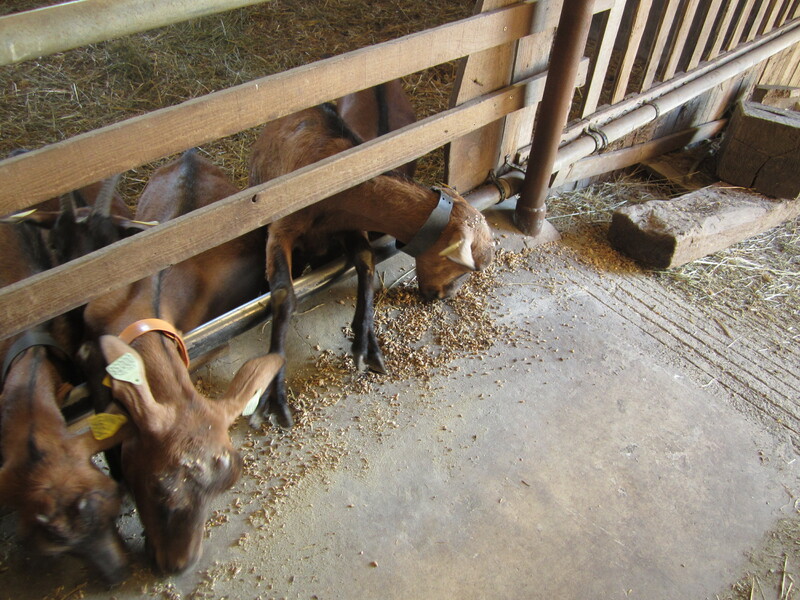 Some extra-greedy goats would even twist and squirm around the bars so they could place their legs and hooves on the platform and scrape more food towards themselves, preventing nearby goats from accessing the surrounding food. 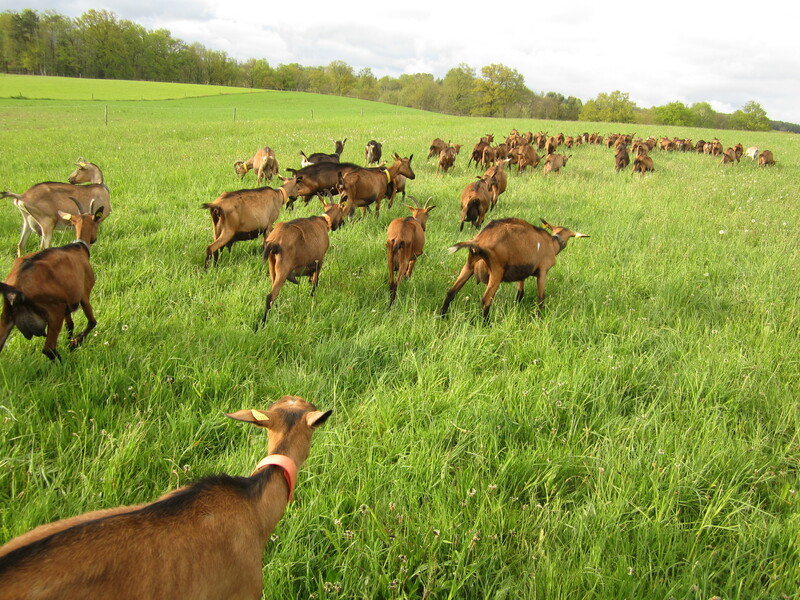 Once 20 or so goats were squished onto each side, we shut the gates and commenced milking. There is a set of pumps for every 3 or 4 goats. I quickly realized that it’s much harder than it looks. The first hurdle is that sometimes the goats really didn’t want the pumps to go on them, so they would repeatedly kick me or squish their legs together so I couldn’t reach. I could sometimes sneak it on them by winding the pump behind their legs, but then they would use their legs to push it off. Often, I would have to give up and ask for help. Once a goat was being particularly stubborn and I asked Gundula for help. With a nice caress on the goat’s side and a few murmured words of comfort, the goat immediately calmed down and accepted the pump. I was really impressed and amazed, and even more so when I tried to do the same thing and was met with still more kicks – this woman clearly has a way with goats. A goat-whisperer! It’s really cool to see the random talents people have – for things I’d never even have imagined. Stubborn goats aside, many of them were complacent. Once the process has begun, the next difficulty is tending to the pumps in a timely manner. At the beginning of each set, I would start 3 to 4 goats pumping. Once I finished attaching pumps to the last goat, the first goat would be done, so I’d have to run over and move the pumps to the next goat. And so on. It’s best to avoid leaving the pumps on for too long after the milk has been pumped out, so it’s really important to stay on top of who’s teats are empty (ew I hate the word teat but that’s what they are! In French it’s la mamelle, a less gross word). After we brought them back from la traite, they were given du foin (hay), de la paille (straw), and de la luzerne (dried alfafa). 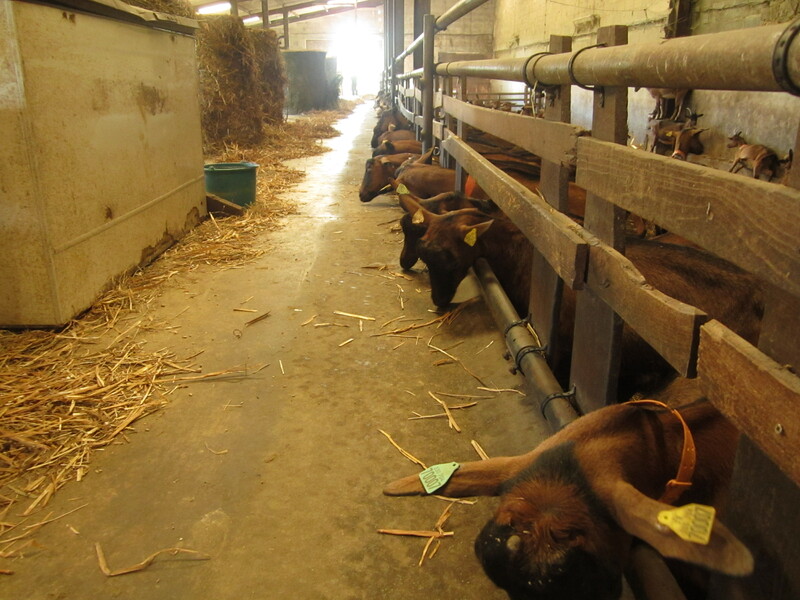 Usually they were fed these dried varieties of hay 4-5 times per day, plus they spent all day grazing in the grass. They were constantly eating! The more they eat, the more milk they produce. Me and the goats! I’m holding a fouet, a sort of whip, but you just use it to get them moving when they get distracted by a tasty-looking flower nearby. It doesn’t hurt them since the end is very flexible. I was present for the full cycle of life during my time on the farm. 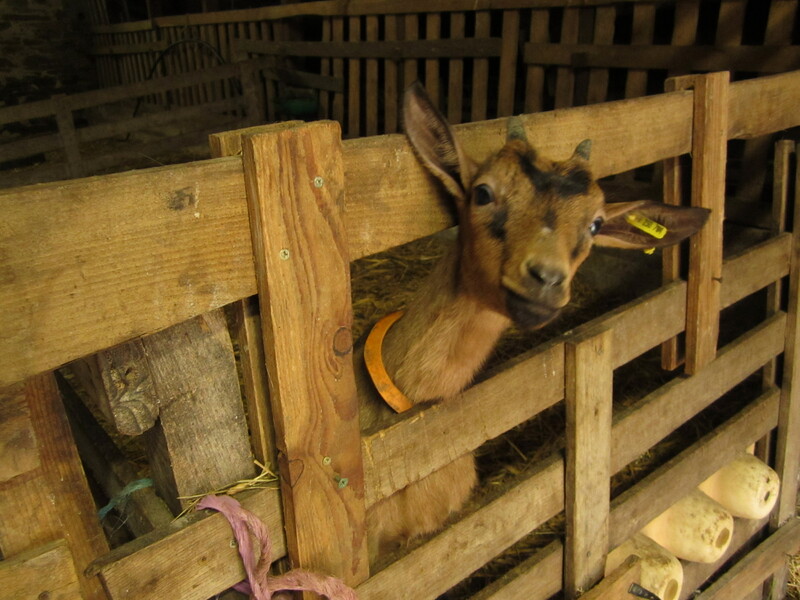 On the second morning, one of the pregnant goats (in French you say elle est pleine = “full”) started going into labor. I expected one of the women to stick around with her to help, but Maëva just said to let her stay off to the side and do her thing. 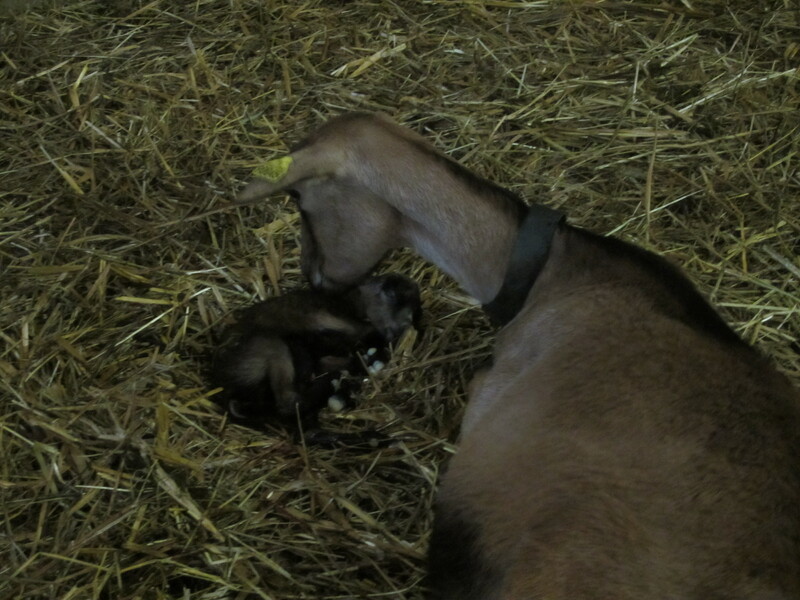 When we got back from feeding the baby goats, she had birthed her baby! I was so excited to see it – he was tiny and cute. His cries were very high-pitched and eerily similar to those of a human baby. We left them alone so the mother could deal with him in his first moments of life. But, a few hours later when we came back to check on them, the baby had died. Apparently it was far too early and the baby shouldn’t have been born for another month or so. 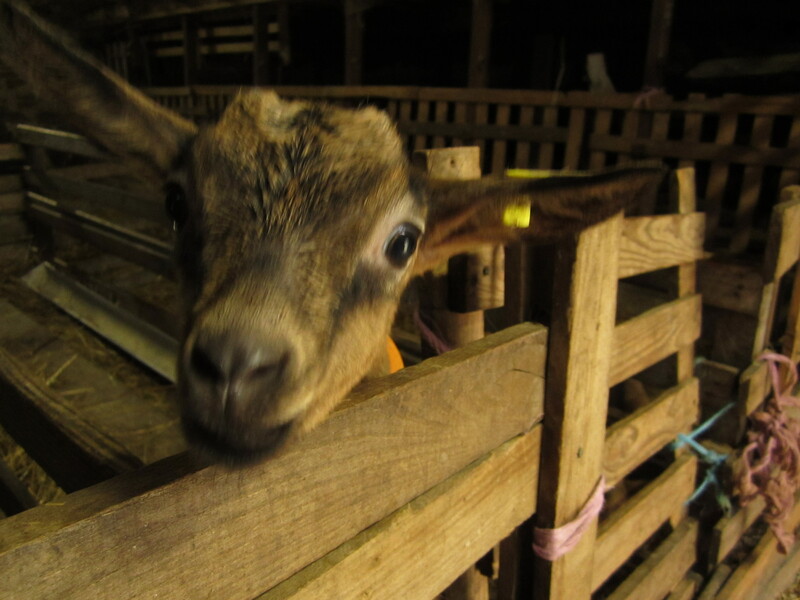 Another older goat fell sick while I was there – she was born in 2002, one of the first sets of goats from this farm! When we were moving her group from one area of the barn to another, she refused to get up. The whole week, we let her stay in that spot, moving her every few hours and bringing her water in a bucket and her own food. As the days passed, her eyes got more and more clouded and she seemed even frailer. Another goat fell sick too, and stayed by her side. When I would come in the barn, they would be cuddling, surrounded by healthy goats. Sometimes the healthy goats were there to steal the food we were leaving for the sick goats, but sometimes they were simply there for moral support. The sick goats died in their sleep before I left. It was sad to see these goats die, but c’est la vie. I can say with confidence that they lived the happiest goat lives possible – the fields they spent their days in were lush with grass and surrounded by open skies and pretty forests. They were well-cared for by three women who clearly love and respect these animals. I really loved the goats! There is no sense in being scared of them. They are very sweet animals. If I was ever standing still around them, they would approach me and nuzzle me so I would pet them. They reminded me of puppies – sometimes they would chew on my pants if I wasn’t paying attention! Also, the cheese made from their milk was delicious. That will be my next and final wwoofing post. 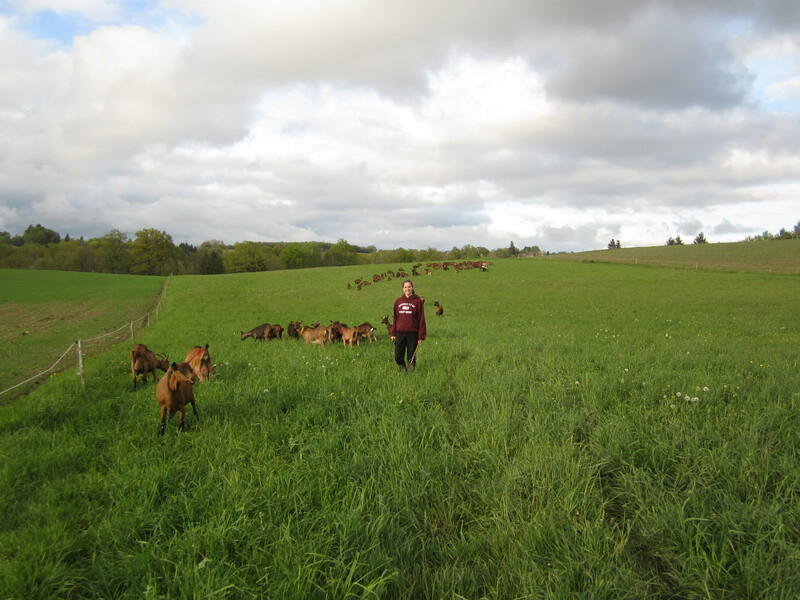 *Update: Click these links for my introductory wwoofing post and my posts about Le Jardinage, Cheese, and my second trip there.